Paytm Send Money Cashback Offer – Hello Friends, How are you all Hope you are enjoying our free recharge tricks. Guys i am writing this post late night because i think about to inform you about new paytm cashback offer . 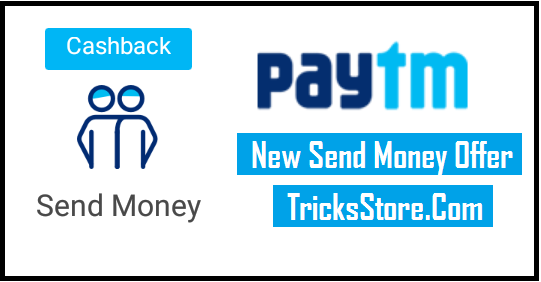 Yes Paytm come up with new send money cashback offer , where you have to send Rs 1 or more and you will get assured cashback in Each & Every Send Money Transaction , New Paytm Send Money offer. How to Avail Paytm Send Money Cashback Offer On Each Send Money Transaction ? 1) Now First of all Just Download Paytm App. 2) After that Install /Open the Paytm App. 4) Now Enter Mobile number and amount & Click on “Send”. 5) Here you done you will recive your cashback within 30 minutes in your paytm wallet. Hurry !! Now Send Money to your anyone to friends or family members of Rs 1 or more and You will get Rs 0.15 Cashback from Paytm wallet. 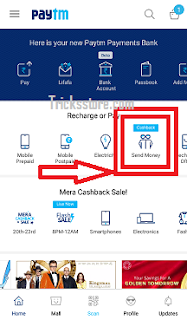 Tricks Store Unlimited Loot Tips – Repeat this whole process until your won’t get cashback from paytm so Now Do it for many times. * The Sender will get assured Cashback Of Min Rs 0.15 instantly. * Paytm solely reserves the right to change/modify the campaign or stop prior giving any notice period. * If Your Friends doesn’t have a Paytm wallet account , Share this post to them so that they can create paytm account and then you can send them money to get cashback.